It&apos;s a film location manager&apos;s dream: Panoramic views of the Hudson River, 28 period rooms with 300 years of history, and all of it only 25 minutes from Manhattan. It&apos;s no wonder that Greystone Court in Yonkers, New York, the gray granite castle, has become a sought-after filming destination for an array of productions, notably, HBO&apos;s crime period drama, "Boardwalk Empire," which airs its fifth and final season this fall. 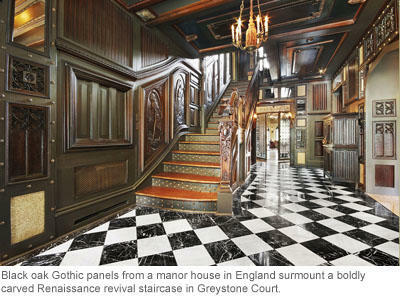 "Greystone Court works for filming any time period in history, and for photo shoots, from mid-market to haute couture," said owner Kohle Yohannan, the museum curator, author, and art historian who purposefully restored the mansion over a ten-year period beginning in 2001. "Many of the rooms were imported in their entirety from 16th, 17th, and 18th century European mansions. Imagine! A private home in New York that has these mini-setups, ready to go." The mansion is frequently splashed on the pages of fashion magazines, such as Vogue (including the American edition and several international versions), Harper&apos;s Bazaar, Vanity Fair, and Allure. Besides "Boardwalk Empire," Greystone Court is also featured in scenes from CW&apos;s Gossip Girl, the feature films Gods Behaving Badly and Mona Lisa Smile, and Beyonce&apos;s music video for her hit song, Irreplaceable. A Horse in the Ballroom! 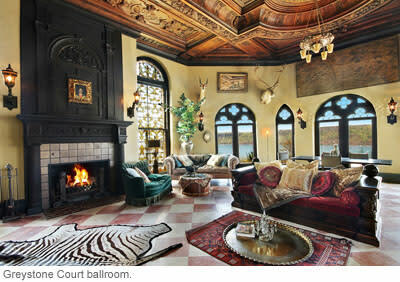 The mansion&apos;s grandeur combined with modern amenities makes Greystone Court a best bet for productions, said Yohannan. Built in the 1880s and expanded in the 1920s, the 14,500 square-foot home&apos;s rooms remind one of a European castle ¬– ballroom, chapel, billiard room, tea room, observatory, music room, tower room – they are enchanting! Add to those elegant dressing rooms, separate suites for celebrities, a catering kitchen, and production suite complete with hair and makeup chairs and garment racks, and you&apos;ve got it made. While Yohannen maintains the privacy of his clients, he will reveal some of the quirkier things that have happened at Greystone Court since he began marketing the mansion as a destination for filming. "Having a horse in the ballroom, well, that was pretty unusual," he laughs. Large productions, for example, are possible at Greystone Court because of cooperative relationships set up with neighboring organizations. Semi-truck and tractor-trailers are able to park in a nearby church parking lot. 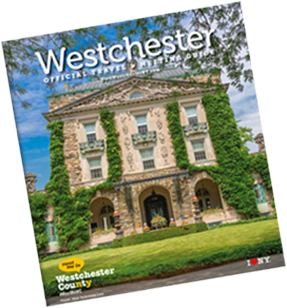 Other nearby locations attractive for filming are easy to get to, such as Untermyer Gardens, Tibbets Brook Park, and the Yonkers Train Station. The City of Yonkers, the state&apos;s fourth largest city, is also easily accessible from major highways, commuter rail, and Amtrak. For more information on Greystone Court, e-mail info@greystonecourt.com or greystonecourt.com.